The women of Swannanoa Correctional Center are in need of spiritual guidance, love and prayer, and your help. 85% of the women at SCCW have been physically, emotionally, and/or sexually abused. During recovery, they begin to understand their need for spiritual counseling to help them heal from the abuse and discover a sense of renewed self-worth and purpose. The chaplain plays a crucial role in the healing process. Named after our longstanding newsletter, Ministry of Hope is introducing our newest option for giving, “HEARTBEAT Recurring Giving.” When a donor signs up for this recurring donation program online, there are no checks to mail and no reminders needed - its all automated! A monthly gift allows our supporters the option to spread the financial impact of their giving across the entire year, potentially lessening the acute financial impact. Supporters may end up giving more on an annual basis, but the distribution of payments across the year makes the commitment more manageable. This also makes recurring giving an especially effective way to increase gift amounts from committed supporters who might not have the financial resources to move up and become “major donors” with larger one-time gifts. Additionally, these ongoing funds will provide regular and predictable support for our ministry, allowing our organization to fund our ongoing operations overall, but also predict future cash flow - giving us a better lead in future planning and outreach. 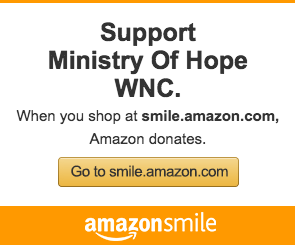 Checks can be made payable to The Ministry of Hope. All contributions are tax-deductible and will be acknowledged with a receipt. Thank you for prayerfully considering a donation to the Ministry of Hope. Spiritual healing is crucial for women who want to break the cycle of poverty, recidivism and generational imprisonment. Our mission is to raise the funds needed to support a chaplaincy program at SCCW, and your help is needed and appreciated.